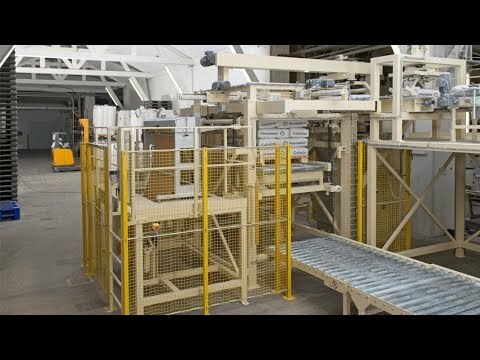 A palletizer that meets the middle and high-level needs of modern bagging lines. Quite suitable for any type of bag closed either by sewing or heat sealing. The HPL SERIES from PT Chronos is designed for bag palletizing in layer formats from 3 to 10 bags per layer for euro, industrial or chemical pallets (others upon request). The High-level layer palletizer is suitable for valve bags and is independent of the kind of bag material. The standard version modules of the HPL SERIES are equipped with a levelling and flattening device; roller conveyor with turning device; loading roller conveyor; pallet magazine for empty pallets; loaded pallet roller conveyor; operating and maintenance platform and a central control unit. 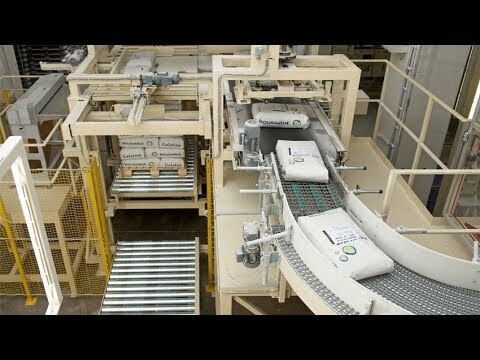 Depending upon the required performance, the modular systems can reach outputs of approximately 2.800 bags per hour.